The moment I smelled this candle, I knew I was going to love it. The scent was right up my alley…. a sweet and warm cookie scent. Rich Vanilla, buttery sugar, Dark rum cream, and chopped almonds. First impression… that scent description is PERFECT!! I could smell all the elements in the description just from smelling the wax – but once the candle was burning…. oh my goodness… delicious!! At first, I could have sworn I was detecting a bit of licorice in the mix but that went away once I lit the candle. Overall, this sent was pure cookie. It smelled like vanilla cookies with the perfect touch of almond and the almond was not overpowering at all like many almond bakeries can become. I smelled warm vanilla, butter, sugar – not so sure on the dark rum cream – but definitely the almonds and oh my goodness was it mouthwatering. A scent that smells just like a cookie you want to eat straight from the oven. Strength – on a scale of 1 to 10, I would rate this candle an 8. Not super strong but a perfect medium. An aroma you notice the moment you walk into the room and I was burning this candle in a fairly large and open room. Very happy. This candle was amazing from start to finish… loved the fragrance! Sweet and yummy cookies galore. The only sad part… this scent has been discontinued by Village so hoping it may make its way back into their classic round collection. It was that yummy and yes, I would absolutely buy it again. Totally recommend this scent should you run across it. Especially if you love sweet cookie scents. 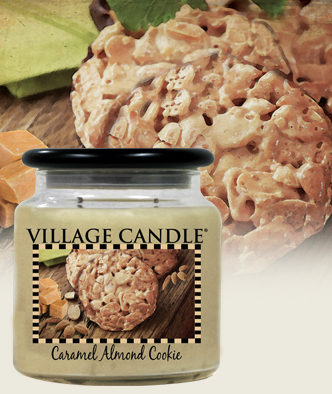 Have you tried Caramel Almond Cookie from Village Candle? Review it with us. In the comment section below, review and star rate your experience… it’s easy! Scent description for Caramel Almond Cookie - Rich Vanilla, buttery sugar, Dark rum cream, and chopped almonds.